This administration will need to lead an effective government that can address policy challenges through strong leadership and effective management. Leaders who understand and can leverage effective management tools and practices are better prepared to execute on their priorities and see measurable, positive program results. The IBM Center for The Business of Government is committed to helping identify and distill the lessons learned from the past, identify current and new management initiatives and capacities that will be needed to address key challenges facing the country in this administration, and offer ideas on implementation. To that end, our 2017 Call for Research devotes particular attention to the needs of this administration. Over the last year, the IBM Center has worked with government partners and stakeholders to assess new research priorities. Our goal is to develop a management roadmap that helps the next administration drive sustained improvement in the government’s capacity and effectiveness. These eight research topics also incorporate the themes outlined in our previous research agenda based on our publication Six Trends Driving Change in Government (i.e., performance, risk, innovation, efficiency, mission support, and leadership). 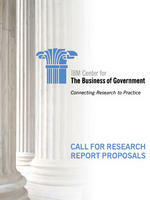 We seek proposals on each of these topics that will culminate in reports with insightful findings and actionable recommendations for government executives and managers who need the best, most practical advice available when it comes to delivering the business of government. Our content is intended to stimulate and accelerate the production of practical research that benefits public sector leaders and managers. We look forward to receiving proposals in response to this research announcement and to continuing our work with the world’s leading researchers. We are happy to answer any questions you have regarding the IBM Center for The Business of Government and our research stipend program. Our next deadline is April 3, 2017.